​D6 was commissioned to bring an Indian focus to the Enlightenment Festival of Light in Durham, which was presented as part of the region's EAST 08 programme. Light of Darkness was created by West Bengali artist Sanchayan Ghosh with support from UK based artist Graham Robinson. The work evolved out of research into the local history and folklore of Durham. The light installation was inspired by folklore surrounding the Venerable Bede after he became blind. It also refers to the history of coal mining in Durham. 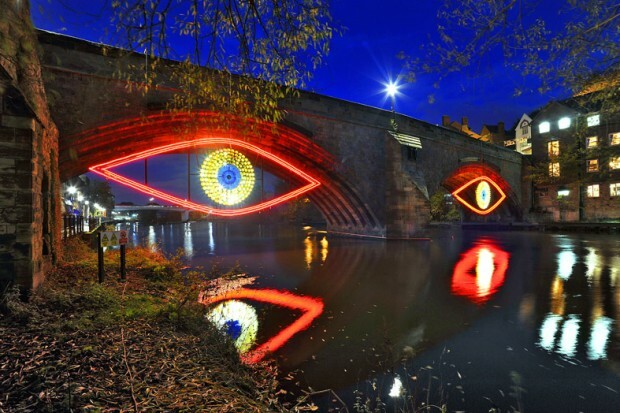 The two eyes installed between the arches of Framwellgate Bridge in Durham were made of miners' helmets with lamps that form the eyeball and the iris is made of a tapestry of EI cold light. The installation is a memoir to the life and work of Saint Bede and the coal miners of Durham. Light of Darkness was presented on Framwellgate Bridge for the Enlightenment Festival, November 2008. D6 engaged Indian curator and producer Nandita Palchoudhuri to produce Calcutta Lights. Nandita worked with traditional craftsmen from Chandannagar in West Bengal to produce two arches of lights to span Elvet Bridge in the centre of Durham. Nandita visited the UK and was in residence at ​D6 during 2008. The commission developed as a response to the City of Durham. 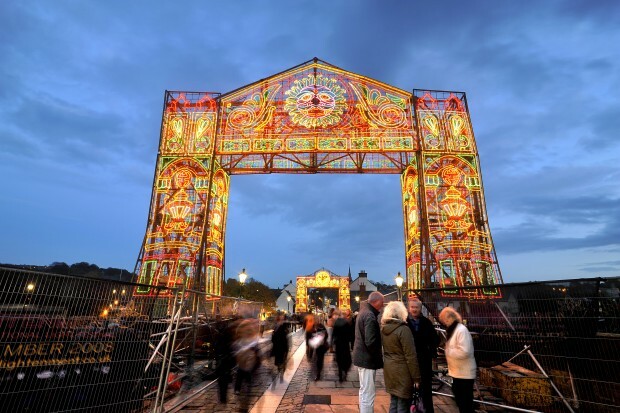 Calcutta Lights was a combination of signature images of Durham incorporated in the traditional giant gates that span the roads of Kolkata during the Durga Festival every year. The Bamboo panels were encrusted with 120,000 hand wrapped bulbs and animated to create a spectacle, unique to Chandannagar in West Bengal, India.